Skin tags are small harmless lumps of fleshy brown, tan, or pink skin. May have a peduncle (stalk) and look like a small piece of soft, hanging skin. Some people are more susceptible to tags, either because of their overweight, partly due to heredity, and often for unknown reasons. Pregnant women and people with diabetes tend to be more prone to skin tags. Initially they are quite small, flattened like a pinhead bump. 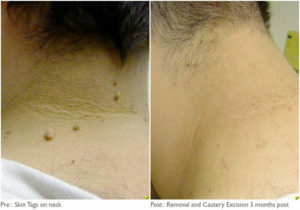 Skin tags can range in diameter from 2mm to 1cm; some may even reach 5cm. Visit our Mississauga skin tag removal clinic to learn more. Or read about other skin care treatments.